Good evening everyone! I hope you had a fabulous weekend and enjoyed the Thanksgiving Holiday if you celebrated. 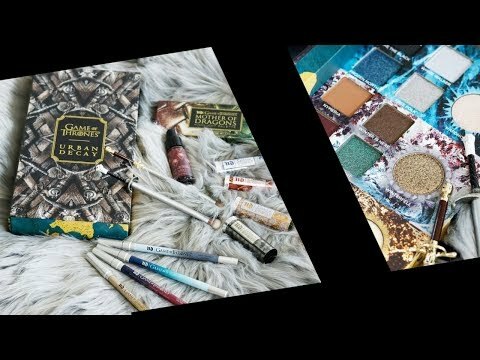 I just got back from Indiana and visiting my family and friends, but I really wanted to get these swatches up to share with you before the Black Friday Cyber Monday Sales end! 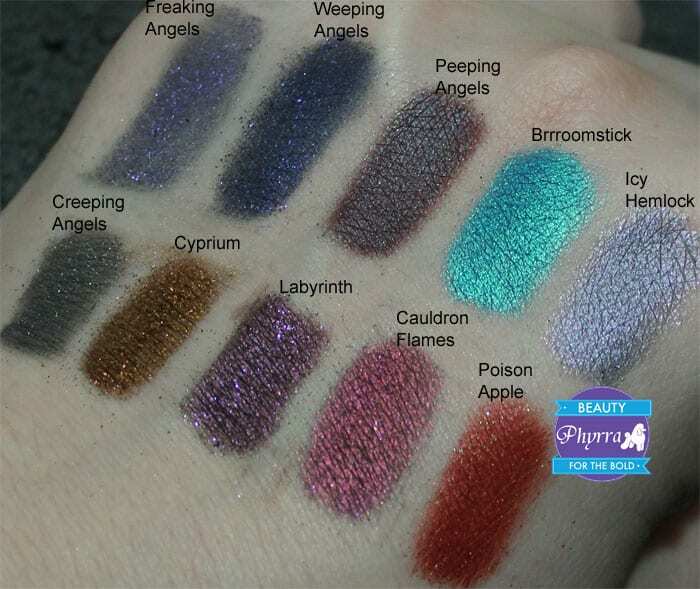 Today I’ve got colors from Morgana Cryptoria Don’t Blink (Dr. Who Inspired), Witchy Wonderland and Mystic Alchemy Collections. These shadows are in a semi-loose formula, which I really like! I swatched these on Coastal Scents Shadow Worx Primer. Morgana Cryptoria is cruelty free and vegan. Rich teal blue with turquoise iridescence. This is currently my favorite teal blue. I’m in love with this color! Wearing Brrroomstick, Freaking Angels and Weeping Angels. See the video tutorial. My Thanksgiving look. wearing Peeping Angels on the lid with Sugarpill Magpie in the crease. 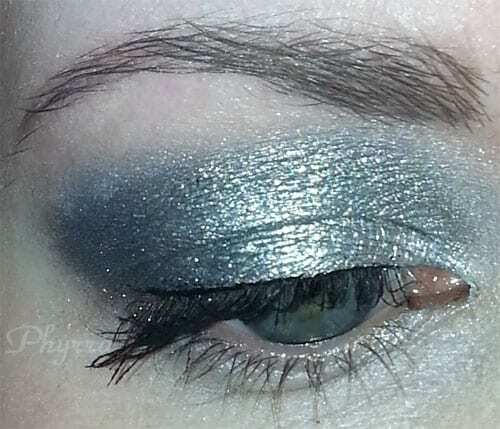 My Strange Angels look with Creeping Angels on top of NARS Transvaal and Intergalactic. See more here. These colors are beautiful and complex! I get typical all day wear on eyeshadow primer with these eyeshadows. I do recommend using an eyeshadow primer with these shadows. 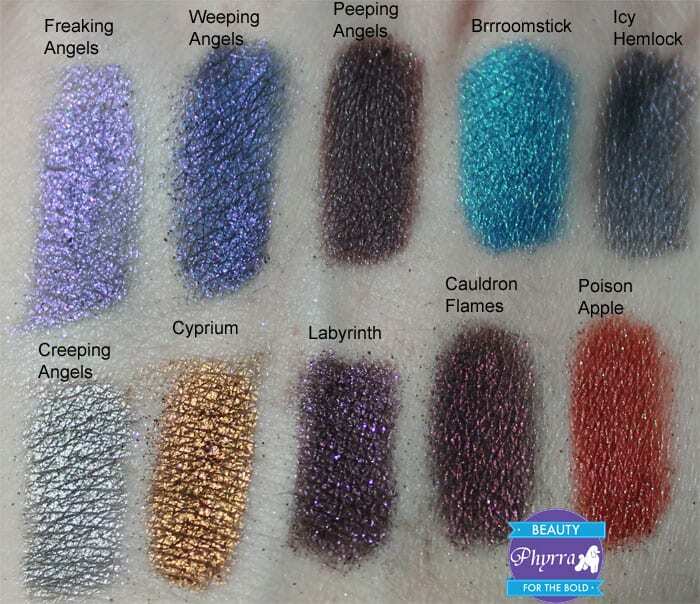 And if you really want to intensify the colors, use something like Fyrinnae Pixie Epoxy to really amp up the colors. I also love the results on NARS eye paints. With the semi-loose eyeshadows, you just run your brush across the top of the product, tap your brush to take off any excess product, then apply. Morgana Cryptoria has a major sale going on right now! You can save 50% or more! So if you love complex, semi-loose eyeshadows, you need to check out the sale. 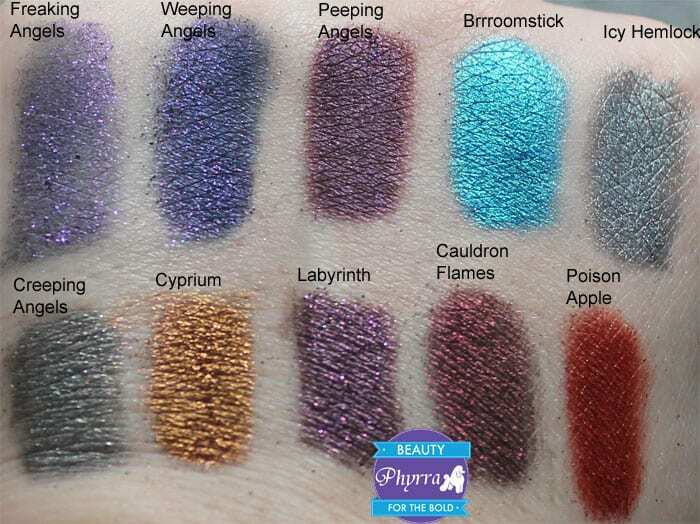 While everyone knows Morgana makes wonderful lipsticks in unusual colors, this new eyeshadow formula has blown me away and I love it! You will see me continue to rave about it! I’ve already placed an order to take advantage of the sale and pick up some more colors! What do you think of the Morgana Cryptoria semi-loose eyeshadows? Great pigmentation. Dou you also own neutrals and soft nudes from this brand? Thank you, 300 and Nutmeg are Gorgeous.